© Photo : US Department of Defense / John Philip Wagner Jr. The Russian Defense Ministry slammed the "cynical" US aviation attack in Syrian airspace, which may be considered an "act of aggression." US Coalition's Downing of Syrian Jet in Raqqa: 'Provocation', 'Limited War' or 'Self-Defense'? 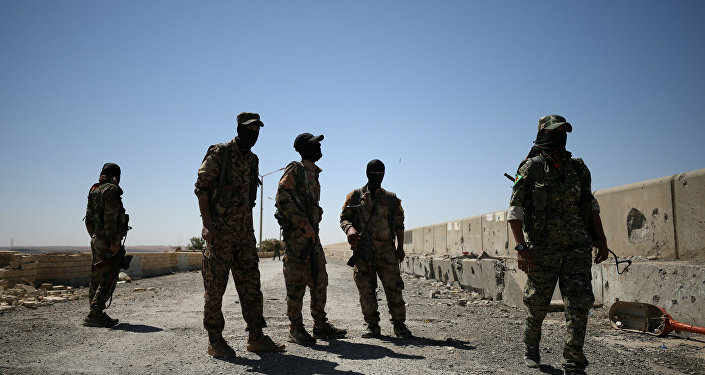 Later, the coalition confirmed the information saying that it shot down the Syrian government forces' Su-22 aircraft as it had allegedly been bombing in an area where US-backed rebel forces, the Syrian Democratic Forces (SDF), were stationed, south of Tabqa in the Raqqa province. The US-led coalition called its attack on the Syrian army's jet "collective self-defense," adding that it contacted the Russian military to de-escalate the situation after the incident. "The destruction of the Syrian Air Force aircraft by US aviation in Syrian airspace is a cynical violation of the sovereignty of the Syrian Arab Republic," the Russian ministry said. "The repeated hostilities of US aviation against the legitimate armed forces of a UN member state under the guise of 'combating terrorism' are a gross violation of the international law and de facto a military aggression against the Syrian Arab Republic." The Russian Defense Ministry said that the US F-18A fighter jet downed the Syrian Air Force's Su-22 launching an air-to-air missile. The ministry added that the Syrian jet was supporting the Syrian army's units which were conducting an offensive against Daesh terrorists near a populated area located some 40 kilometers south-west of the city of Raqqa. "As a result of the strike, the Syrian jet was destroyed. The pilot of the Syrian Air Force's Su-22 ejected over an area controlled by Daesh terrorists. His fate is unknown." The US-led coalition command didn't use the deconfliction channel with Russia to avoid an incident during an operation in Raqqa, the ministry said. In response to the attack, Russia decided to halt all interactions with the US within the framework on the memorandum of incident prevention over Syria.